Bronze with green patina on black marble base. Resting on the hand are two birds with wings extended ready to take off in flight and a male figure resting on his back. 56" x 48" x 60"
With the LEAPING GAZELLE of 1936, this sculpture brackets a half-century of creativity. The hand, symbolic of a higher being, gives support or perhaps transport to the individual who is accompanied by two flying swans. The upward flowing contours of the hand, the human form, and the swans communicate the optimistic spiritual content, or meaning, of the sculpture. Fredericks was inspired by the 139th Psalm, verses 9 and 10: "If I take the wings of the morning, and dwell in the uttermost parts of the sea; even there shall Thy hand lead me, and Thy right hand shall hold me." This is inscribed on the pedestal of the cast in the Sculpture Garden, as well as the pedestal of the cast in the columbarium of Kirk in the Hills Presbyterian Church in Bloomfield Hills. 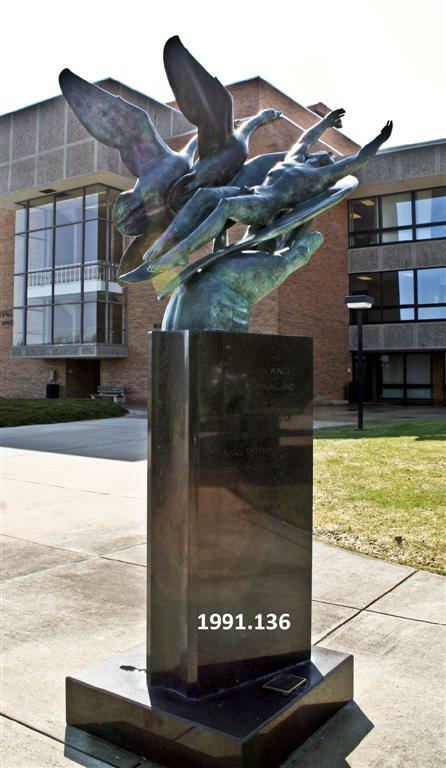 Fredericks, Marshall M., 1908-1998, “Wings of the Morning [Bronze],” Marshall M. Fredericks Sculpture Museum, accessed April 21, 2019, http://omeka.svsu.edu/items/show/5176.